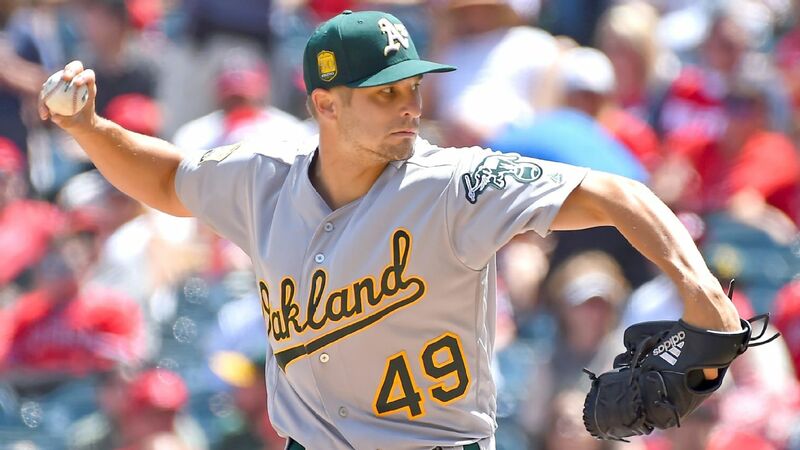 OAKLAND, Calif. -- The Oakland Athletics have optioned opening day starter Kendall Graveman and fellow right-hander Chris Bassitt to Triple-A Nashville. The A's also announced Thursday that right-hander Wilmer Font will be added to the 25-man roster a day after being acquired in a trade from the Los Angeles Dodgers. Graveman was 0-5 with an 8.89 ERA in six starts. He has the most losses, runs allowed (28) and hits allowed (41) in the majors. Graveman was last optioned to the minors in 2015 after starting the year 1-2 with an 8.27 ERA in four starts. He came back a month later to go 5-2 with a 1.78 ERA over his first nine starts following his return. Bassitt was called up from Nashville last Friday but didn't get into a game before being sent back down. Font was 0-2 with an 11.32 ERA in six relief appearances with the Dodgers before he was designated for assignment on Monday. He was traded to the A's for minor league left-handed pitcher Logan Salow on Wednesday.